World Candidates 2013-3: More fire!! Overview: Today’s games showed energy and ambition… with mixed results. Vassily Ivanchuk was attempting to change his course after losing a tough game yesterday. Today his experiment against Levon Aronian was punished. The Armenian played the best game of the tournament thus far with a number of hammerblows to capitalize on Ivanchuk’s draconian 9. h4 attack. This approach didn’t appear to fit with the setup. 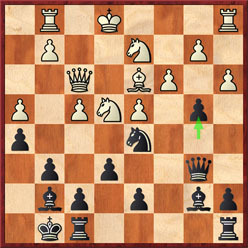 Aronian shifted the action to the queenside with a thunderous 14…b5! hoping that 15.Bxb5 Qb6 gives black an easy game. Moves later, black used the pawn as a battering ram with 18…b4! (Diagram #1) White’s king got stuck in the center and soon black’s pieces were buzzing dangerously about the board. 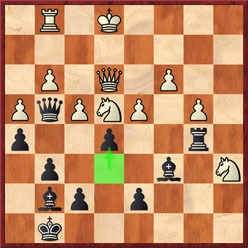 The final break of 29…e5 (Diagram #2) was an ambitious attempt to shatter two pawn islands at once. While aesthetically beautiful, it turns out that this was ill-advised. It is doubtful that Aronian was playing for the clock since he condemned such actions in the press conference. Nevertheless, Ivanchuk had his king dangling in the wind and black’s queen lead a demolition forcing resignation. In the final position, black would play …Bf8 at some point and the swords were poised to skewer the exposed king. Magnus Carlsen got his first win by persisting to grind down a beleaguered Boris Gelfand. In what appeared to be a rather equal ending, the world #1 ended up using his pawn majority and a well-placed knight in the center of the board to bring Gelfand’s position to a collapse. Carlsen keeps pace with Aronian with a win. Long tournament, but it’s important for Carlsen to keep sights on Aronian who seems to be in magnificent form. Radjabov was punished for his overambition… Svidler is joint 2nd on 2/3. Svidler-Radjabov resembled a Benko Gambit. However, black ended up playing for a queenside initiative that never materialized and white ended up on the stronger side of two minors against a rook. Svidler ending up with a mating attack forcing Radjabov to sacrifice an exchange and resign a few moves later. Kramnik-Grischuk got nothing out of their Grunfeld conversation. Video by GM Daniel King. I think you should switch Krammik and Svidler results from the third round. BTW… Aronian’s 29…e5 was not that good. It was probably a good time pressure move however.